What The New Google Algorithms Like Panda 4.0 and Payday 2.0 Mean For Your Blog? Google is in the process of rolling out a couple major updates to its search algorithms since the past few days. Speculation was that the nasty Penguin would be updated. But it's the sterner (yet probably gentler at the same time) Panda that they've decided to update with the Panda 4.0 update. Another relatively lesser known algorithm, Payday was updated to 2.0. Both these updates mark some important changes in SEO that can be expected to steer further developments. 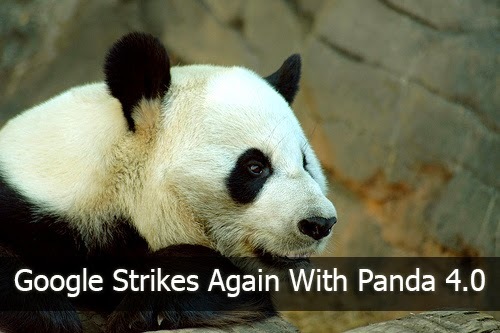 After Google confirmed that it was rolling out Panda 4.0, it became evidently clear from the numbering scheme that it is a major update, unlike the regular smaller updates that are often no more than data refreshes. So what we're looking at here is a major algorithmic update, the kind we saw back in 2012 or 2013. The Payday Loan algorithm, although independent from Panda and Penguin, also impacts search queries. Introduced back in July 2013, Google used the algorithm to laser-target some extremely spammy queries. This was, by no means, a generic search algorithm, and it effected a very few queries - but hit them hard. This time around, with Payday 2.0, the overall effect still remains fairly unnoticeable for most websites.The update is very query-specific, and only hits very spammy websites. If you run such a website, you probably wouldn't have much traffic left by now. Otherwise, you'd barely notice the effect from this update. Some experts reckon this is the biggest update for 2014. So if your site hasn't been effected by it, then you probably have a few more months' breather before you have to worry about the next big thing. It would somewhat premature to say what the effects of these updates will be. Historically, it has taken Google days to roll out its Panda updates. And this one shouldn't be an exception. As of right now, it is still being rolled out. So a verdict cannot be passed as yet. However, there do seem to be some big shifts in the rankings - as there are with any update. There are some big losers, and some big beneficiaries. One such example is eBay, which has lost most of its search traffic, and has not dropped from 8th place to 20+ in global ranking. And this is just the beginning - who knows what horrors lie in wait in the next few days. We do have a few numbers for you. Google says that Panda 4.0 impacted 7.5% of English-language queries. The impact of the Payday 2.0 update is estimated to be much lower, impacting just ~0.5% of the search queries for English, while the impact might be larger, as much as 5% due to more spam-to-content ratio. For Bloggers, it can only mean one thing. Make hay while the sun shines! If large sites like eBay can go down, so can you. Your only safeguard is to virtually eliminate spam on your site, and enhance your internal linking structure of your blog. Only then would you ever be 'safe' against future updates of any sort. We still don't know what is the reason behind this? ?